Siblings snuggle on the hospital bed. What if it’s the last time I kiss him goodnight? What if they wheel him away and it’s the last time I see him awake? What if this chemo session doesn’t work and it’s the last medication he gets, this medication that makes him so sick? What if this is my last picture? What if this is the last visit between my children? I am a natural born worrier, and the fact that my four-year-old had Acute Lymphocytic Leukemia did not help that character trait. The “acute” part of that name had us worried for a year, as he walked on the edge of neutropenia. I worried a lot about whether or not there was going to be a “last” moment. 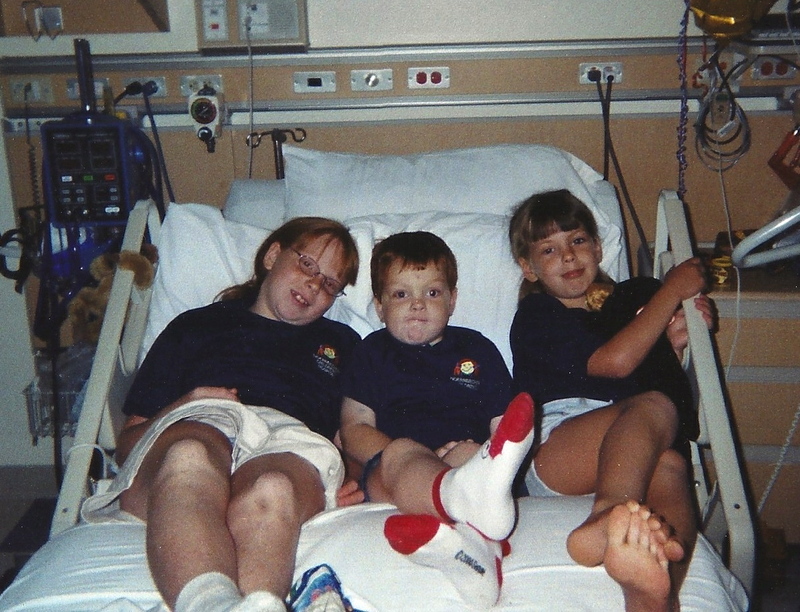 One day, relatively early in Andrew’s treatment, my daughters asked me if it was okay to have fun, since Andrew was sick. They had asked that question on the first day of school, which was the first day of Andrew’s diagnosis, and I thought we had dealt with that issue. But they were under the impression that they needed to pray non-stop and not enjoy themselves too much, in case each moment might be Andrew’s last. From that moment I decided that if any moments were going to be our last, they were going to be joyful. Both girls piled on Andrew’s hospital bed, we zipped his wheelchair around corners, watched movies together, read stories together and prayed together. While I couldn’t shake off my worry, I tried to ensure that if any moment was going to be the last moment, it was going to be a good one, and no one was going to be alone. That was nine years ago. He’s in long-term remission. The cancer did not win. But my hopes that each moment would be precious and that our family would not separate without knowing they are each loved unconditionally has not changed, but only grown stronger. My oldest daughter left for her first year of college this week, she goes with our blessing, and with a memory of her lying on our bed, laughing as she squished me and the other kids joinedthe pile. My middle daughter’s on a campout this week, my memory of our sign language “I love you” as she ran her suitcase into the building sticks with me while she’s gone. Myson has his first soccer game this Sunday, and I will watch remembering the time spent kicking and trapping his soccer ball in the back yard and the sprints we ran together. It doesn’t matter whether this moment right now is the last one, or a precious new beginning, or a middle transition time; if our every moment is filled with God’s blessings and His joy, then those moments will last forever. Make each moment last and make each last moment a good one.